Cosmic Shimmer Polished Silk Glitter is an ultra fine craft glitter that produces a silky smooth finish when applied to cardstock, chipboard and other surfaces. 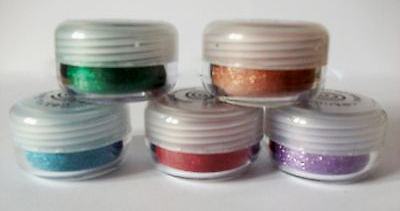 Polished Silk Glitter can be used with Creative Expressions Double-Sided Self Adhesive Sheets, Cosmic Shimmer Flake & Glitter Glue, Scotch Double-Sided Tape and Cosmic Shimmer Dries Clear Glue. Once applied, the Glitter can be over stamped using dye inks or Archival Ink Pads, also over stamped with Perfect Medium and heat embossed gently with Embossing Powders, decorated with alcohol based markers, used with embossing folders to create dazzling embossed designs and die cut.